Updates and commentary as the Red Sox take on the White Sox in Chicago tonight. FInal: Red Sox 3, White Sox 1: David Ross hit a 1-2 pitch for an opposite field double to drive in Mike Napoli to give the Red Sox the lead in the ninth. The White Sox tied it up in the sixth after breaking up Jon Lester's no hitter with three consecutive hits to push a run across. Xander Bogaerts crushed a Chris Sale pitch 444 feet to break up Sale's no-hitter with his first home run of the season in the top of the sixth inning. Play of the game was White Sox center fielder Adam Eaton robbing David Ortiz of a home run to end the first inning. Bogaerts hit for the third time in the last two nights. Taking to that two-hole, Victorino-style. Three innings and no hits for either the #RedSox or #WhiteSox . Lester and Sale are dealing. It's in the air, I feel it. RT @GordonEdes Silly to do so this early in a game, but I'm sensing a no-no here tonight. Sale and Lester sharp. How often do you see it? Guy catches a mundane pop-up to end the inning and leads off the next by striking out.
.@JLester31 puts the White Sox down in order. We are scoreless after 1. How many times do you see it? Guy makes a great catch and then grounds out to lead off the next inning. Wrapped//RT @kpluby : @GordonEdes any word if Napoli is wearing extra padding for his finger?
. @AdamSpankyEaton makes a leaping catch at the wall to rob a home run from David Ortiz! Eaton with a leaping grab in center field to take away an Ortiz home run. Sale raises both arms in celebration. Adam Eaton robs Ortiz of a home run, running to wall and reaching up above the yellow line for the third out of the first inning. 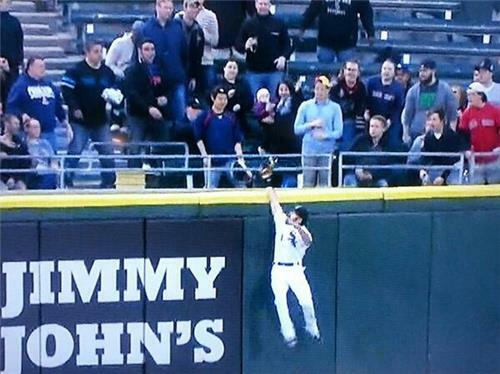 What a catch by Adam Eaton. Leaps and reaches over the fence to rob Ortiz of his 3rd homer of the year. David Ortiz is left clapping at an outfielder for the 2nd time in five days. First Ichiro robs him of a double, now Adam Eaton steals a HR. Hold on, I’ll consult my list of when players will get hits // RT @Eroths711 : @PeteAbe Any idea when we'll see Bogaerts start to hit more? Adam Eaton takes a home run away from David Ortiz. Sensational catch.